The year 2018 might very well go down in history as the year of the outboard explosion! From a host of brand new outboards from new manufacturers entering the market, to a plethora of exciting new engines from existing manufacturers – all that latent R&D is now expressing itself! In our annual marine power feature we undertake a comprehensive review of what’s on the market to power your boat. From outboards to sterndrives to inboards – in gasoline, diesel, propane or electric power options – we shine the spotlight on the entire line from every marine engine manufacturer. We look at what’s new for the coming season, what engines got retired, and what tried-and-true workhorses are still in the lineup. The focus is on helping you pick the engine that’s right for you and your power or repowering needs. It was a massive year for Mercury in terms of new product releases – the largest in their 80 year history. Not just new product, but truly entirely new products featuring new engines right from the block up. Their all-new next-generation 4.6L (279 cu.in.) 64 degree V8 engine features Dual Overhead Cam, 32-valves, computer controlled EFI with Advanced Range Optimization, electro-hydraulic power steering, an 85 amp alternator with idle charge, and run on regular 87 octane fuel, while still providing up to eight percent better fuel economy. 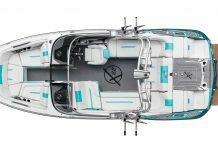 All the new engines feature a brand new cowl design that features an easy-access flip-up hatch that makes it easier to access the dipstick to check the oil, and add oil if necessary, from inside the boat. Mercury Marine offers the largest and widest range of marine power products in the world from outboards to sterndrives to inboards to jet power, in both gasoline and diesel fuel options, we take a look at each line separately. Outboards. 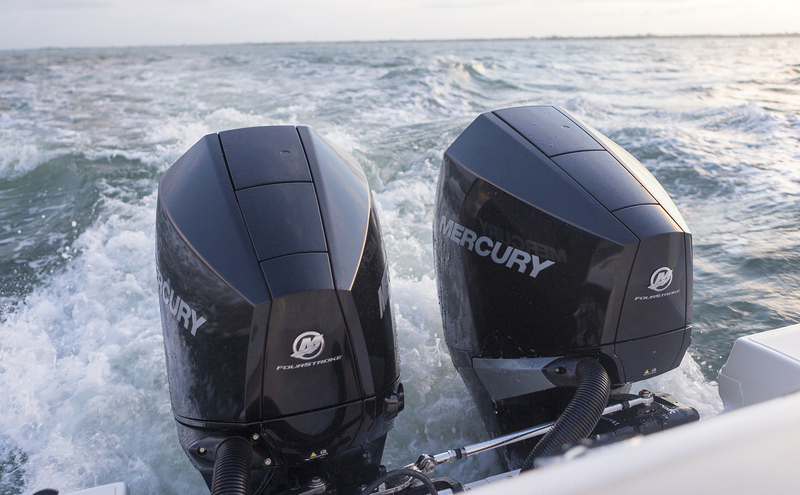 Within the Mercury outboard lineup there are five model lines: Verado, Pro XS, FourStroke, SeaPro, and Jet. The four-stroke Verado line was already a huge hit with boat builders and consumers alike, but in February 2018, Mercury took this already successful line over the top with a complete overhaul. For 2019 there are just three engines in the Verado line. The new-in-2015 Verado 350 is still available – it’s a 2.6L inline six-cylinder and is the lightest 350hp outboard on the market by 95 pounds. The all-new-for-2018 300hp and 250hp Verado engines are based on the all-new 4.6L 64 degree V-8 engine with Dual Overhead Cam and 32-valves. The PRO XS line offers lightning-quick acceleration, blistering top speed, legendary reliability, and lightweight design. The new 200, 225, 250 and 300hp models are based on the same all-new 4.6L 64 degree V-8 engine as the Verado engines. The new 175hp model is based on the all-new 3.4L V6 powerhead. The 150hp Pro XS remains the same for 2019, based on the 3.0L inline 4 cylinder engine block. The 115 Pro XS model that was introduced in 2016 features a 2.1L inline 4 cylinder engine. The 9.9hp and the 15hp EFI PRO XS models are both 2 cylinder engines. The two-stroke/direct injection OptiMax outboard line is now retired. The Jet-powered lineup features five models of four-stoke outboards from 25hp (inline 3 cylinder) and 35hp to 80hp (inline 4 cylinder). All outboards offer the optional center-mounted Big Tiller with a convenient power trim switch, the shift lever, and an optional digital troll control to adjust engine speed as low as 700 rpm in 10rpm increments. The single inboard jet model is a SportJet® drive based on the 200hp V6 Direct Fuel Injection (DFI) OptiMax engine. The SeaPro line of commercial outboards got a major injection this year as well. 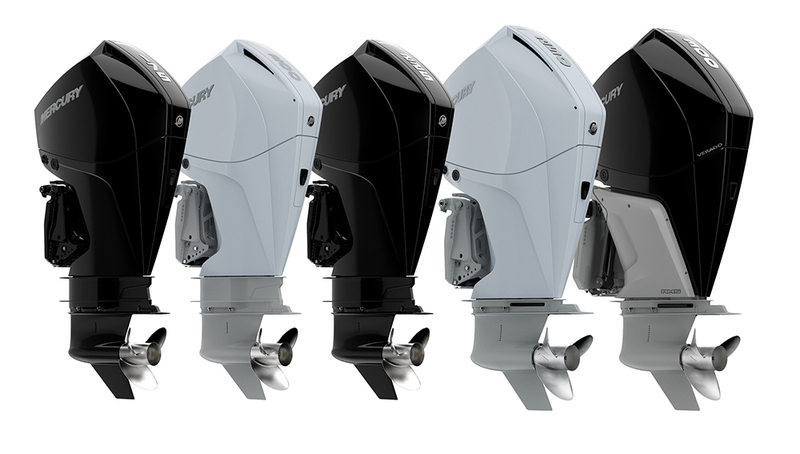 There are now five SeaPro high horsepower outboards from 200 to 350hp. The 200hp engine is based on the brand new 3.4L (209 cu.in) 64 degree V-6 with Dual Overhead Cam and 24-valves introduced in February 2018. The 225hp to 300hp, both AMS and CMS, models share the Verado’s all-new 4.6L (279 cu.in.) 64 degree V-8 engine. 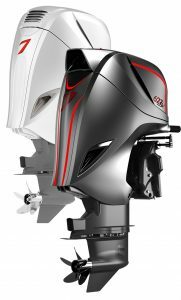 There are four mid-range SeaPro outboards: the 75-90-115hp engine share the 2.0L inline 4 cylinder engine, and the 150hp with the 3.0L inline 4 cylinder engine. Finally there are three lower range horsepower Sea Pros – the 15, 40 and 60hp. All SeaPro engines feature Mercury’s proprietary formula XK360 an extremely low copper content aluminum alloy, which leads the industry in corrosion resistance, the larger Command Thrust gear case, and twice as stiff upper engine mounts compared to the recreational model engines. 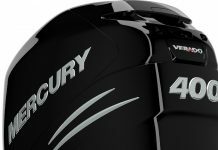 Completing Mercury’s four-stroke outboard line are an additional twenty-plus engines from 2.5hp up to now 300hp –with the introduction of the all new 250 and 300hp FourStroke based on the new 4.6L engine. The single cylinder 2.5hp to 6hp portable models all feature integrated fuel tanks for true portability. The 8hp and 9.9hp inline twin-cylinder models are the lightest weight kicker motors in their class. The inline three-cylinder 25hp and 35hp models feature battery-free electronic fuel injection. The game-changing 150hp inline four-cylinder still reigns as the lightest 150hp outboard on the market – and Mercury claims it’s also the easiest to service. When the 4.5L V6 was introduced as the world’s first purpose-built marine sterndrive, we knew it was merely a matter of time before Mercury would choose to create their own block for their larger displacement engines. That’s exactly what they did. The 6.2L V8 engine is new in every way: every part, every system, every idea was rethought and re-engineered. It was built specifically for marine use rather than adapting and marinizing an automotive engine. So it is not burdened with automotive restrictions and unnecessary technologies that add additional cost and complexity without adding value or power. The result is a perfect balance of power, easy maintenance, superior corrosion-resistance and a quiet, pleasurable ride. The 6.2L V8 comes in four configurations: with and without ECT, and 300hp and 350hp versions produced by the 377 CID/6.2L block that features a 4.0” x 3.75” (101.6mm x 95.25mm) bore and stoke. The 8.2L V8 is available in three configurations: 8.2 Mag (380hp); 8.2 Mag ECT; and 8.2 Mag H.O. ECT (430hp). All Mercruiser sterndrive engines run on 87 octane fuel and can withstand 10% ethanol blends. Inboards. 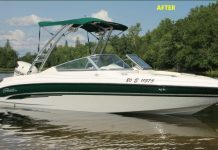 The MerCruiser inboard line consists of six models from the 6.2L (300hp) to the 8.2L H.O. (425hp), with all engines being available with DTS. 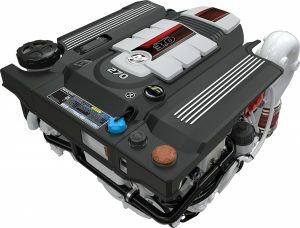 There are two TowSport inboard engines in MerCruiser’s lineup – the T6200 ECT and the T6200 H.O. – producing 320hp and 370hp respectively from the 6.2L block. Both engine feature customization options with either black, red or silver accents. At the 2017 Miami International Boat Show, Mercury announced that their Joystick Piloting for inboards for either single engine or dual engine installations, as well as for tow sports boats, was now available. Diesel. 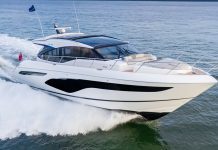 The MerCruiser diesel family had a new addition in August 2018 with the introduction of the all-new 3.0L diesel sterndrive engine, available in five configurations from 150hp to 270hp. The new 3.0L diesel leads its’ mid-range class in acceleration, reliability, ease of installation and maintenance, and mitigation of noise, vibration and harshness (NVH). The Mercury Diesel 6.7L midrange common-rail engine was introduced at the 2017 Miami International Boat Show and is offered with three power levels – 480hp, 500hp and 550hp – with either inboard or Mercury Zeus pod-drive installations. The diesel line now offers seven different engines, each in several different horsepower ranges, from the TDI 3.0L V6 diesel to the 6.7L inline 6 cylinder. All engines feature thermostatically optimized closed-coolant systems, ultimate corrosion resistance backed by a 3 year warranty. Mercury’s VesselView Mobile app for iOS and Android platforms, was introduced in the fall of 2016. 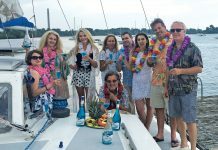 The app instantly provides users with access to their boat’s SmartCraft® digital data via their smartphone and won a 2016 IBEX Innovation Award. In 2017, the company unveiled their largest multifunction display, the VesselView903 features a bright 16×9 aspect ratio, high definition glass touchscreen, a built in 10Hz GPS and chart plotter capability. It also provides a descriptive fault text display and up-to-date information for 30+ engine parameters. Rather than taking a traditional engine block that was originally designed for a carbureted flow of fuel, and adapting it to perform with a direct injection fuel delivery model; the new G2 block was designed from the get-go to be a direct injection engine. The end result is an outboard with 20% more torque, 75% lower emissions, and 15% better fuel economy –– not to mention the longest operating time before a required scheduled maintenance period. Plus it’s available in over 400 custom colour combinations as well. 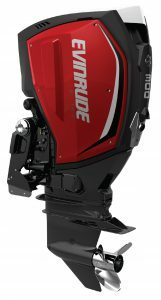 Today Evinrude offers eight G2 models from the 150hp 66-degree V6 to the 300hp V6. If you took your new Evinrude E-TEC G2 engine on its maiden voyage today, it wouldn’t require its first dealer-scheduled maintenance until January 2024! Most of the original E-TEC outboards are still available. These tried and true workhorses remain unchanged for 2019, but max out at 150hp, leaving the higher horsepower range to the new G2 engines. There are five High Output (HO) engine in the E-TEC lineup from the 15hp HO to the 135hp HO. There are two V6 engines from 115 to 150hp that feature a unique mix of the largest displacement in their class and the lowest weight. The two V4’s (90H.O. and 115hp) engines weigh in at just 390 pounds. There are nine E-TEC two-stroke outboards inline models from 15hp H.O. up to 90hp. 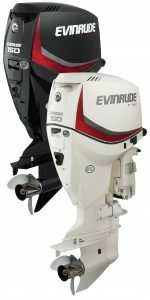 In this same power range, Evinrude also offers a 30hp and a 55hp MFE – multi-fuel engine. The purpose-built E-TEC pontoon series offers just two models for 2019 – a 90hp and a 115hp – that feature rubber motor mounts, special gearing and larger displacements for more torque. There are three jet outboards in the Evinrude lineup – two inline 3 cylinders – 40hp and 60hp – and one V6 – 105hp, which claim to be the lightest jet outboards available. Finally, there are five portable outboard models from 3.5hp to 15hp, and one 15hpHO model. All original E-TEC engines require no dealer scheduled maintenance for 3 years or 300 hours (even the iridium spark plugs don’t need changing), are 3-Star and EU rated with extremely low Carbon Monoxide emissions and require no oil changes – ever. Yamaha Motor Canada offers exclusively four-stroke outboards in seven different groupings in their engine line. It’s been a busy couple of years for Yamaha. In 2017 they introduced a total of six new engines: a new 25hp, a new 75hp, a new 90hp, a new V MAX SHO 115 X-Shaft and a new V MAX SHO 175 X-Shaft. There’s also a new mechanical version of the 4.2L 300hp – the largest displacement outboard in its’ class. You can now get mechanical versions of six engines – the F150, F175, F200, F225, F250 and F300. 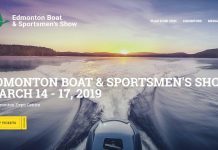 This past fall they introduced a new 25hp purpose-built kicker, and the all-new 425 horsepower V8 XTO Offshore outboard. Yamaha’s nine portable outboards range from 2.5hp to the new 25hp. The new F8B was released fall 2014, and a new single cylinder 72cc (4.4ci) F2.5B was added to the line in January 2016. The F25C is a two-cylinder, in-line SOHC 432cc 25hp four-stroke weighing in at just 126lbs – the lightest 25hp outboard on the market – in either two or four stroke! It features battery-less EFI, an electric start option, and it won a 2017 IBEX Innovation Award. 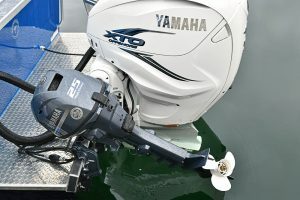 New this past fall, the two cylinder T -25C was designed from the skeg up as a kicker engine for today’s larger fishing boats – offering more torque without a larger gearcase, and at just 145 pounds, the T-25C is 28 percent lighter than Yamaha’s current F25 which weighs 201 pounds. 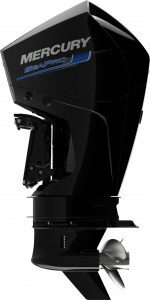 The mid-power line consists of eight outboards from the 30hp model to the new F90B – featuring a single overhead camshaft and four valves per cylinder that is 13 pounds lighter than the original F90 that is now retired the lineup. The new F75B is the lightest 75hp four-stroke on the market, the F75 is still available. The V MAX SHO family offers seven different models for 2019 from the new VF90 to the VF250 X-Shaft. The V-MAX SHO 250 and 150 models are available in 25-inch shaft version, which Yamaha calls “X-Shaft”. Two new V MAX SHO models – a 115hp and a 175hp were introduced in the spring of 2015, and are also available in X-Shaft, as is the new VF 90 VMAX SHO. The high-power line now consists of eight outboards from the new F115 introduced in 2016, all the way up to the new upgraded F350C that also debuted in 2016. The F115B weighs in at just 377 pounds and features a 1832cc (111.8ci) in-line four-cylinder engine, Yamaha’s patent-pending Shift Dampener System (SDSTM) to reduce the ‘cluck’ of shifting gears, and is available with mechanical controls. It fits in a 26” mounting centre space which is great for the repower market. The new-in-2015 F175’s in-line four-cylinder 2785cc (170.0 ci) fuel-injected engine is matched with a 50 amp alternator. The 200hp model is still the lightest on the market at just 487 pounds. The five models designated as High Thrust – from the 9.9hp to the 60hp – feature large-diameter, low-pitch propellers that direct the exhaust away reducing cavitation. They are ideally suited for kicker or pontoon applications. Yamaha also offers five jet drive models from the inline 3 –cylinder 40hp to inline 4-cylinder 150hp, all based on the prop version of the same engine. Yamaha unveiled a new CL7™ touchscreen display in 2017 that offers precise and user-customizable engine and boat systems data for up to four outboards on one screen, along with a host of other MFD functions, such as maps, fish finder and graphing capabilities. Their new Helm Master™ control system is more than just a joystick. It is a fully integrated boat control system with an electronic steering system, throttle and shifting controls, an electronic key system and a joystick controller. The system is only available on new installations (not the repower market unfortunately), but can now handle up to four engines! Volvo Penta’s roots date back to the 1900’s when the first engine – the B1 – was built, but it was 1959 when Jim Wynne’s Aquamatic sterndrive changed modern boating forever. The company has continued to innovate and produce at least one new major product every decade or so since. It was 2012 when Volvo Penta released the new 364 cubic inch V8-380 based on GM’s fourth generation small block called the L96, and a new tuned-down 5.7L V8-225. Then in November 2014, they added two more new second-generation sterndrive engines – a 4.3-liter catalyzed V6 engines – rated at 200 and 240 horsepower – to the V6 product line. The Volvo-Penta ‘Forward Drive’ was unveiled in the spring of 2015. The revolutionary forward-facing sterndrive was inevitable given Volvo’s IPS prop-forward pod drives. The Forward Drive produces a much more customizable wake for water and tow sports, tighter turns thanks to the directional thrust, and a faster time to plane compared to an inboard engine. 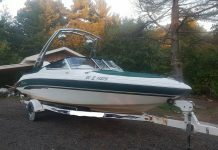 The Forward Drive, mated to your choice of 13 engine options (from a 4.3L V6 with 200hp to a 6.2L V8 with 430hp) has become standard equipment or at least a preferred power option in many tow sports boats. In November 2015, Volvo-Penta unveiled the new family of next-generation 5.3L V8 engines featuring the industry’s first direct fuel injection for better low-end torque and unmatched fuel efficiency. The new lightweight all-aluminum block allows these engines to offer unparalleled power-to-weight ratio, and a standard closed cooling system ensures a more consistent internal temperature, longer life with no internal parts exposed to raw or salt water. Spring 2017 saw the company unveil the all-new D13 1000hp diesel inboard. 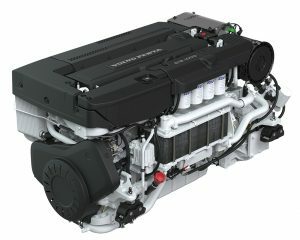 The 12.8L in-line 6-cylinder engine is the most powerful in Volvo-Penta’s Leisure engine lineup. The D13 combines fuel injection with twin-entry turbocharging to deliver a massive 1000hp on demand while delivering a world-class power-to-weight ratio resulting in excellent comfort, reliability and longer cruising range. The Volvo-Penta Aquamatic gasoline sterndrive line powers 20 to 45 foot boats with thirty-eight different engine-outdrive combinations, available in non- and catalyst versions, from the 4.3L V6 200hp with DPS drive to the 6.2L V8 430hp with CE/DPS drive. The Volvo-Penta diesel sterndrive lineup features a dozen different engine and drive configurations from the 2.4L D3 140hp with SX drive to the 5.5L D6 400hp with DPH drive to service boats up to 45 feet. For yachts from as little as 30 feet to up over 120 feet, Volvo’s IPS inboard engine lineup now offers nine engines from 370hp (5.5L – IPS500) to 1000hp (12.8L – IPS1350. Their diesel inboard shaft line offers twenty-eight engine choices for powerboats from the D1 (0.5L – 13hp) to the new D13 (12.8L – 1000hp). Volvo-Penta’s entire marine leisure engine range is now compliant with the new European Union Recreational Craft Directive Stage 2 (RCD II) emissions regulations. 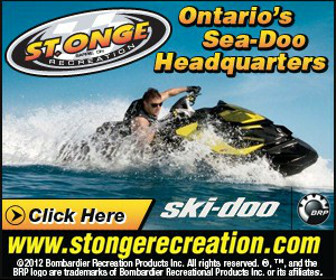 To find the best setup for your boat try the ‘engine configurator’ app on their website. In July 2017, Volvo-Penta became a majority owner of Seven Marine and thus entered the outboard market for the second time in their history (the first was in 1973 when they acquired outboard production from Monark-Crescent, sales slowed and production ceased by the end of the 70’s). 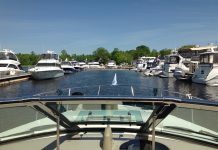 The Volvo-Penta Easy Drain System, a 2016 IBEX Innovation Award winner, is designed with an anti-siphon vent that allows the engine to drain while still in the water. The anti-siphon vent is actuated automatically with the push of a single knob, without disconnecting any water hoses. The new-in-2018 Water Sports Control system is Volvo’s latest step forward in their Easy Boating initiative. 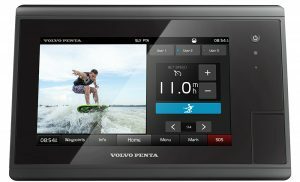 The Water Sports Control system is designed to create a unique user experience for wakesurfing, wakeboarding and waterskiing enthusiasts. It’s fully integrated with the Forward Drive, Electronic Vessel Control (EVC) and Glass Cockpit systems. “Wakesurfing is one of the fastest growing trends in today’s boating market, and we’re seeing even more boatbuilders bringing to market a new class of boats optimized for water sports enabled by Volvo Penta’s Forward Drive technology,” said Ron Huibers, president and CEO of Volvo Penta of the Americas. 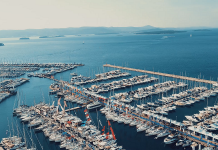 Finally, in a prediction of the near future, Volvo Penta issued a clear statement of intent this past summer that by 2021 it will provide electrified power solutions for both its land and sea-based business segments. 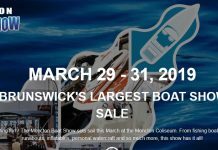 Watch for new hybrid and all-electric marine solutions as the storage capacity of batteries increased and the price continues to drop. 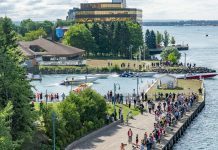 Founded in 2010, Seven Marine is a team of hand-picked marine engineers and technicians, based in Milwaukee Wisconsin, who are proven innovators with decades of experience. The company is focused only on making the most powerful and technologically advanced, highest-performing outboard motors on the planet. In July 2017, Volvo-Penta became a majority owner of Seven Marine, which still operates as a separate company. The common thread between Volvo and Seven Marine is the automotive based platform that Volvo’s sterndrives and Seven Marine’s outboards are based on. Last year, we predicted an expansion/enhancement of the Seven Marine product line as a result of the Volvo investment. That’s just what happened. In September 2018, the company achieved CE Certification and thus moved into the European market. Last February at the Miami International Boat Show, they introduced two brand new models: the 527 and the 577. The 627 is a truly ultra-luzxury outboard designed to move those who move the world. At its’ core is a 376 cu.in (6162 cc) horizontal 90 degree V8 four-stroke engine block that produces 627 hp @ 5600 RPM – and it runs on regular 87 octane fuel. Their new contra-rotating CR gearcase is offered on all three outboards. It supports the largest blade area in the industry, ranging from 18 to 19.5 inches, with four- or five-blade props options. For 2019, Seven Marine offers a new optional two-year limited warranty extension on top of their standard three year warranty. 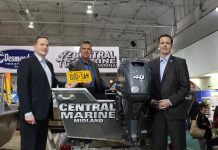 Suzuki’s Canadian marine division has benefitted greatly from increased support from head office over the past couple of years and now offers four-stroke outboards from 2.5hp to 350hp. In the eight model portable outboard line ranging from 2.5hp to 30hp, there are four battery-less fuel injection models – the DF15A and DF20A introduced in 2013 – and the DF25A and DF30A which won the 2014 IBEX Innovation Award. These new engines allow smaller boat owners to benefit from the increased fuel economy and easier starting that fuel injection offers without the need for an external battery. New in 2018, were the DF4A and DF6A – the lightest outboards in their class – these models offer three-position storage, better acceleration and quieter operation than the models they replaced. The mid-range line has twelve different models from the 3-cylinder 40hp to the 4-cylinder 200hp all of which feature the company’s Lean Burn Fuel System that uses up to 14% less fuel in the mid-range speeds where outboards spend most of their running time compared to the original engine models. Finally, the high-power line has five models based on the 55 degree V6 block with power outputs from 225hp to 350hp. 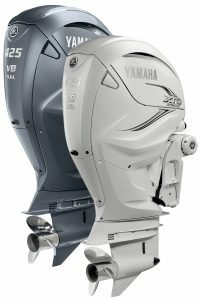 Their newest engine – the 350hp outboard – began with a blank sheet of paper and features 4.4L of displacement, a DOHC 24 valve design with Multi Point Sequential Electronic Fuel Dual Injection with Lean Burn and Oxygen Sensor, a final gear ratio of 2.29:1 and a pair of counter rotating props. The design features two smaller gears, in a smaller gear case, as opposed to one large gear for a single prop, resulting in better hydrodynamics. It’s available in counter-rotation for dual engine installations. While the standard colour for Suzuki engines is black, their SS line comes in a matte black finish with red accents, and cool white is also available upon request. Suzuki offers a 3+3 Suzuki Protection Plan 6 year warranty on all models. Honda Marine manufactures four-stroke outboard engines from 2.3hp to 250hp. There are six portable models from 2.3hp (the lightest weight 2.3hp portable engine in the industry) to 20hp – including the new 4hp model that features a 1.5L built-in fuel tank and is available in short (15”) or long (20”) shaft lengths. The Honda mid-range line consists of eight models from 30hp to 100hp. Their most powerful mid-range engine was introduced in the fall of 2015. The new BF 100 is a 4-cylinder, 1,496cc (91.4 cubic inch) 4-stroke model weighing in at 366 pounds (166 kg). Like all Honda Marine outboard engines, it’s based on the same design and technology that powers Honda automobiles such as the Accord, CR-V, Civic, Fit, Odyssey, and Pilot. The new engine features a neodymium magnet flywheel that produces 44 total amps and 35 charging amps; Lean Burn Control that automatically adjusts the air/fuel mix according to speed and load while maximizing power throughout the acceleration range – providing best-in-class fuel economy in cruise mode (2,000 to 4,500 rpm); and Variable Valve Timing and Lift Electronic Control™ (VTEC™) first debuted in the Acura NSX sports car, VTEC™ technology offers a broad, flat torque curve and smooth power delivery throughout the outboard’s entire operating range. 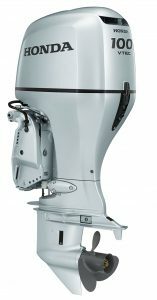 The large outboard line features four models from 115hp up to the flagship of the Honda outboard fleet: the BF250 – introduced in 2011. The 250hp 3.6L 24-valve sixty-degree V6 outboard is based on the Honda Odyssey minivan engine and claims to have the best-in-class fuel economy. That, along with a host of other innovations and advancements, went on to help the BF250 win an IBEX Innovation award that year. The entire Honda outboard line meets the rigorous California Air Resources Board (CARB) 3-Star standards. They also offer a True 5-year, non-declining limited factory warranty. Honda hinted at a new design featuring a unique carbon-fiber wing-blade around the engine shroud when they introduced their concept engine at the 2017 Miami International Boat Show, but we haven’t heard or seen anything new from them on this front since. Tohatsu is Japan’s oldest outboard manufacturer, and has been producing high quality, durable outboard motors since 1956. 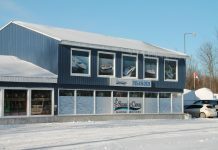 Tohatsu America Corporation is the U.S. and Canadian distributor of Tohatsu Outboards. 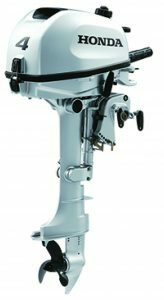 Tohatsu’s outboard line is divided into four segments: portables, mid-range, high power and TLDI. The portable line offers eleven models from 2.5 to 20hp – including a 5hp propane model. Their 4hp, 5hp and 6hp featuring a front mounted shift handle – an industry first in this horsepower category. The eight Tohatsu mid-range four-stroke models range from 25hp to 90hp. The three cylinder (526 cc) 25hp model features a battery-less fuel injection system. The 90hp four cylinder (1,497 cc) model weighs in at just 366 lbs. There are five larger high-power engines from the in-line 4 cylinder DOHC 16 valve 115hp model, to a 250hp 3.5L narrow design V6 that features a 90 amp alternator and an industry first: separate dual air circuits so cooler denser air is delivered to the intake. The TLDI (Two stroke Low pressure Direct Injection) line features seven models from 25hp to 115hp. The line offers the fuel efficiency of four-stroke engines with the power associated with a two-stroke engine. All Tohatsu outboard engines meet or exceed the U.S. EPA emission regulations and have earned the California Air Resource Board (CARB) 3-star Ultra-Low emission rating, and come with a 5-year limited warranty. Nissan Marine discontinued outboard sales a few years back now, but all Nissan outboards are fully compatible with Tohatsu parts and accessories. 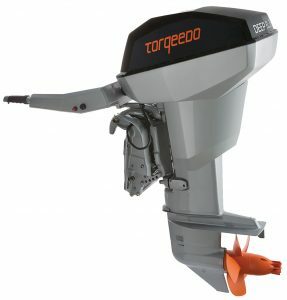 After being supported for the past twelve years in business by venture capital, Torqeedo – the manufacturer of electric outboards and now inboard engines – was purchased by Deutz in 2018. (Since 1864, Deutz has offered highly efficient natural gas and diesel engines to the industrial, agricultural and commercial vehicle marketplace.) The move appears to be a good one for both sides. Deutz gains valuable expertise in the electric motor arena, and Torqeedo benefits from decades of expertise in supply chain management and sales and service. We predict a major expansion of the Torqeedo line in the near future. 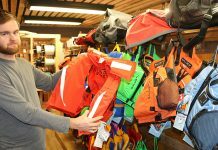 Torqeedo makes 14 different outboard models – that have proven themselves in both power and reliability for over a decade – ranging from a very portable 1-hp outboard to an 80-hp commercial grade outboard! 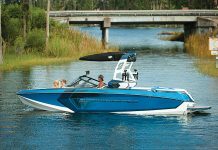 The Deep Blue line, for commercial operators and green boaters, includes a hybrid drive system with power options up to the equivalent of 40, 80 and 160 hp. Torqeedo’s electric inboard model was introduced in 2016. Called Deep Blue, the i-1400 line is for heavy displacement boats, and the i-1800 line is for planning yachts. Both represent the first high-power electric propulsion system in serial production. Available in 40hp or 80hp versions, the true inboard design works as a shaft drive or sail-drive. The battery comes with a long-term battery capacity warranty: 9 years after commissioning, the batteries will still have 80 % of their original capacity, even if you use them every day. 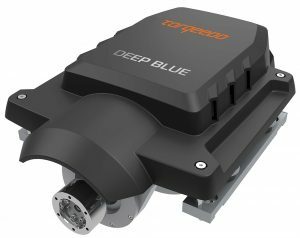 In 2018, Torqeedo partnered with BMW to offer the proven BMW i3 battery as a part of the Deep Blue system. The durable high-capacity i3 batteries from industrial production offer the highest energy density currently available in boating – at a lower cost per watt hour than ever before. The “Torq Trac” is a dashboard for electric motors that tells you on your smartphone how far you have left to go on the battery. A solar powered 45W battery charger keeps both the travel and ultralight models topped up with free solar power. Torqeedo’s Power 26-104 lithium ion battery features unique intelligence that protects against short circuits, overloads, deep discharge and wrong polarity, while providing an incredible performance of 2,685 Wh for only 55 lbs of battery weight. 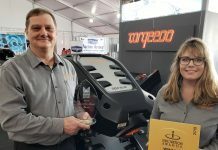 For lakes which ban or restrict the use of other engines, Torqeedo opens up a whole new world of powerboating with performance without breaking the rules or costing a small fortune. 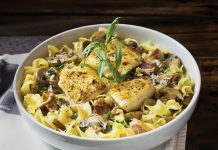 It’s been almost a decade since, in 2011, Lehr first introduced their all-new, and later award-winning, propane outboards. In the beginning, only a 2.5 and 5hp model were available – powered by a small screw-in propane tank same as you would use on your tabletop BBQ. In 2014, the company added a 9.9hp version. A propane engine does not pollute the water, has no ethanol or fuel-related issues, produces zero evaporative emissions, starts easily with no priming or choke required, and requires no winterizing. Propane has a 110 octane rating compared to 87 to 93 octane ratings for gasoline, which simply means more power per stroke. The Lehr patented 3-Stage Pressure Regulator and Needle Jet Fuel Delivery Technology deliver precise fuel metering, producing the cleanest and safest emission levels at all engine speeds and loads, while also increasing power and reliability. In fact, in January 2017, the EPA certification of Lehr’s propane powered 15hp outboard achieved a 53% cleaner carbon monoxide emission rating than all other engines in its class. In 2015, Lehr announced their all new 25HP (30.4 cu in / 498 cc) outboard motor powered by an external propane tank, and an internal battery that featured an easy electric start with no rigging or battery clutter in your boat. 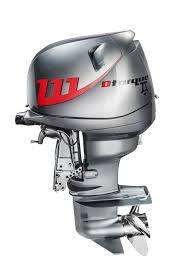 The 25hp outboard weighs just 172 lbs (20” shaft) to 194 lbs (25” shaft) and comes with a full 3-year warranty. The new Dtorque 111 two-cylinder 50 hp diesel outboard features a torque output of 111 Nm at just 2,500 rpm; a fuel economy of under 12 litres of fuel per hour at full throttle; a class-leading exhaust emissions rating that falls well within the latest EU RCD 2 limits; and an expected lifespan of well over 10,000 hours – at least double that of any comparable gasoline outboard. The two-cylinder common-rail turbo charged diesel engine, uses a unique system of dual counter-rotating crankshafts inside an aluminum block, which dramatically reduces the vibration levels that a conventional small two-cylinder diesel engine would normally generate. The technology features a patented ‘Spaceball’ design that not only achieves less vibration but also less noise, lighter boat handling and less stress on the engine. Yanmar has been building engines in Japan since 1911, it was 1930 when they released their first diesel – a two-cycle vertical 5hp model. Today, Yanmar offers two recreational diesel engines for both sterndrive (110hp to 272hp) and inboard (110hp to 383hp) power boat design needs. Joystick control is an available accessory. Diesel engines produce about 50% less carbon monoxide emissions compared to gas engines, the difference can be attributed to compression versus spark ignition of the fuel. In fact, in the marine sector, the emissions standards from the US EPA mandate stricter restrictions on diesel engines than on gasoline outboard engines. We expect to see an expansion of the diesel outboard offerings in coming seasons. 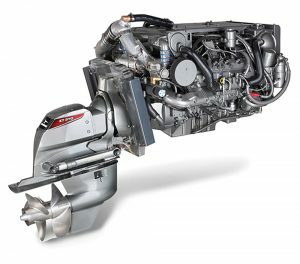 Cox Powertrain unveiled the world’s first 300hp diesel outbound engine at the 2018 Fort Lauderdale International Boat Show. 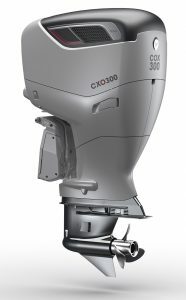 This revolutionary diesel engine, the Cox CXO300 is the world’s highest power density diesel outboard engine. It was specially developed to rival the power, performance and weight of a gasoline outboard, with the additional benefit of diesel economy – in line with NATO’s single fuel policy, which aims to cut the use of petrol-driven equipment in favour of diesel – and will be of particular interest to commercial and professional boat operators, as well as the recreational boater. The engine is based on the proven technology of a 4-stroke, V8 architecture, and features a 266 cu.in. (4.4L) displacement that creates 479 ft. lbs. of torque and delivers 300hp at the prop shaft, while weighing just 826 lbs (375 kg). 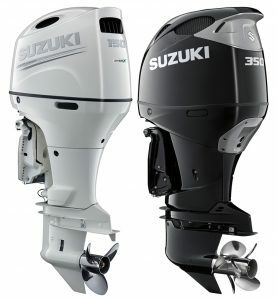 (In comparison – that’s 100% higher peak torque at the crankshaft than the leading gasoline 300hp outboards and is 60% higher compared to a leading 350hp.) It offers at least a 25% better range compared to a gasoline outboard, longer service intervals of approximately 1,200 hours, and is designed to have up to a three times longer lifespan. Available in the UK currently, the company plans to build a plant in Florida to produce the new engine for the North American market. Back in 1934, the inventor of the electric trolling motor, Mr. O. G. Schmidt, named his company after his town and state. Celebrating over 80 years in business, Minn Kota is a division of Johnson Outdoors, and offers a plethora of both freshwater (15 models) and salt-water (8 models) trolling motors, in 12-, 24- and 36-volt versions, that mount off the bow or the stern . The very unique “engine mount” line of trolling motors from 55 to 160 lbs thrust install directly onto your outboard’s cavitation plate. Their single e-drive 48-volt electric outboard, can run for two hours at full speed (5mph) on a single charge – perfect for gasoline-restricted lakes. Options include cable steering, electric steering or hand steering. Or add their i-Pilot Link that uses GPS technology and ethernet connectivity to allow some Minn Kota motors, Humminbird fishfinders, and LakeMaster digital GPS maps to communicate with each other. 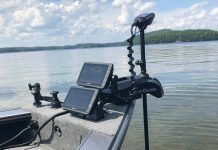 “The ability to store and record location data on the fishfinder, and the ability to have the trolling motor use that data for automatic navigation, is something that fishermen have been asking for. Now with i-Pilot Link they finally have it,” said Senior Product Manager Dave Maryanov. MotorGuide has been well known for their electric trolling motors since the 1960’s when their “Guide-Rite” model was the first to patent the use of a rack-and-pinion steering system that made the directional control of the motor more sensitive and reliable. Today, the company has eight Freshwater models with 12, 24 or 36-volt power options, ranging from 40 to 105 pounds of thrust, each with hand, foot or wireless controls and three blade Machette III props designed by Mercury Propellers. MotorGuide invented the salt-water tolling motor category and today their saltwater series includes six models in 24- or 36- volt power options, with thrust ratings from 89 to 109 pounds.